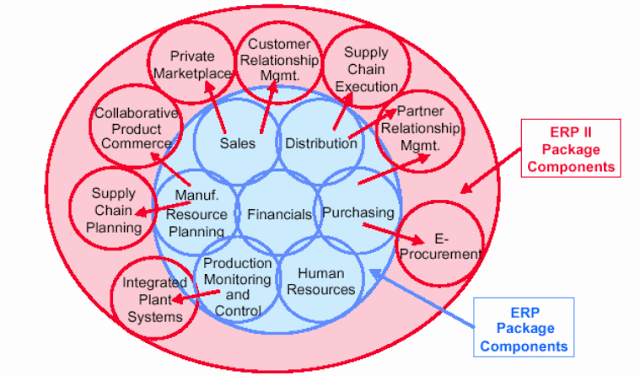 ERP is defines as an integrated software package which integrate all the department of an organization. Several department of an organization are marketing, sales, finance, production etc. Since an ERP package integrates these entire departments, thus the performance of an organization will be improved. It is used to manage the important part of business including product planning, purchasing, maintaining inventories, customer service etc. Every department has its own computer system optimized for their particular work but an ERP system combines them all together into a single computer through integrated system approach. In short ERP system provides a single database where business transaction are recorded, processed, monitored and reported. ERP system does not replace the computer of a particular department rather it integrates all the department of an organization into a single computer and provides a flexible database. Reduction of inventory due to JIT approach. Integration of information i.e. integration of all the department of an organization. Sharing of common data and information. Improvement in the quality of the product at the same price. Lowers the total cost in supply chain management through JIT approach. Migrating the data from old system to new system and ensure that data to be migrated is accurate and authentic. Building interfaces to other system like office system. User training: Training of the user can be started at the tine of test run and user of different department are to be trained in there respective areas. It includes: logging in and out, getting to know the system, trying sample transaction in the entire department. Parallel run: Under this business transaction are carried on both new system as well as old system and the implementation team take care of any problem or errors which comes to the light of parallel run. User documentation: It is different from general documentation. It includes how to carry out transaction. Post implementation: It generally involves queries from user and minor changes can be possible in the formats. System monitoring and fine tuning: IT peoples monitors system closely to see performance aspects so that end user can get the full benefits of ERP system.